As part of my efforts to green up my beauty routine, I tried natural shampoo and conditioner for the first time last year. My conclusion after that experiment? 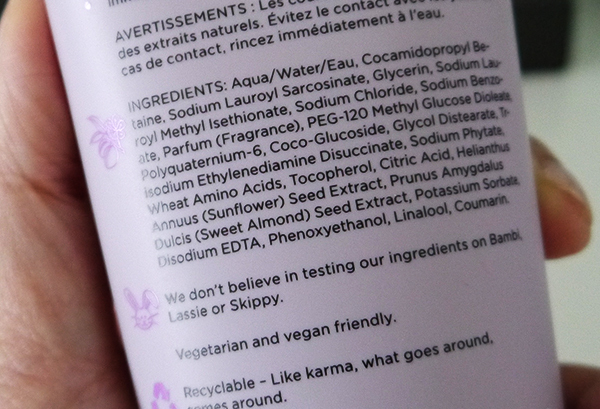 While natural haircare could leave my hair feeling clean, healthy, and shiny, it didn't do much beyond that. It simply lacked the smoothing silicones and polymers that would give my locks the groomed, polished, fresh-from-the-salon look. 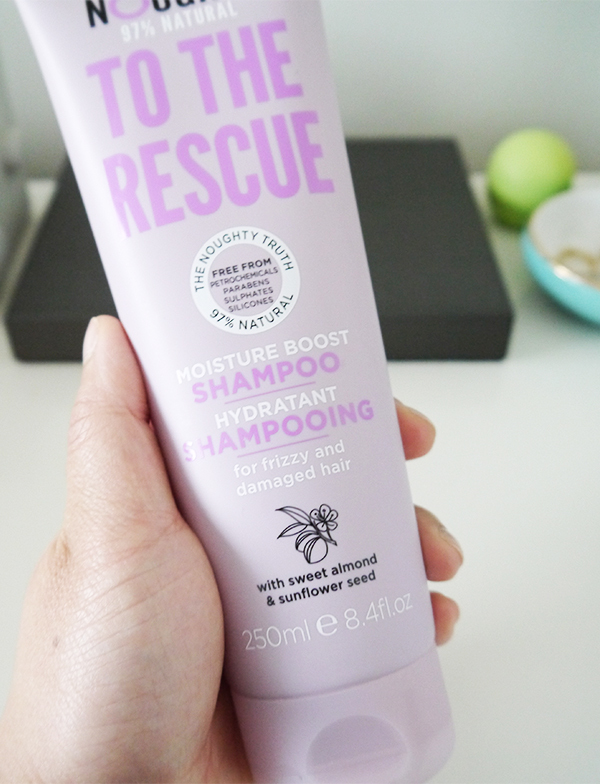 For anyone else who's ever felt they're sacrificing transformative and textural improvements when switching over to natural haircare, well, Noughty Haircare might be the answer to your prayers. Noughty is a UK-based line that just launched in Canada in fall 2017 and is available at London Drugs. 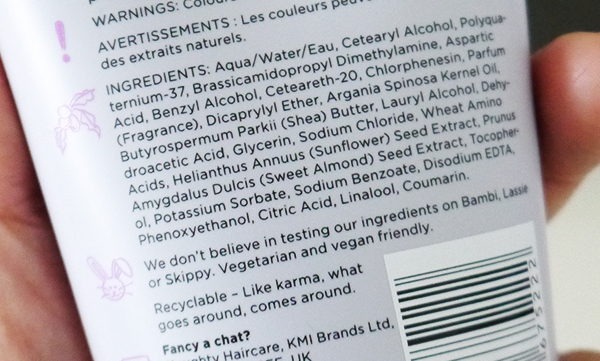 The formulas are 97% natural, vegan, and free of petrochemicals, parabens, sulphates, and silicones. 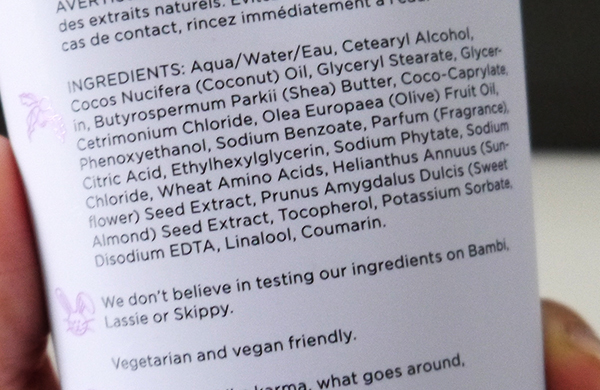 None of them are tested on animals. The ranges available are suitable for normal to dry hair and are meant to moisturize, hydrate, soothe scalps, or define curls. (Sorry, fine-haired gals.) 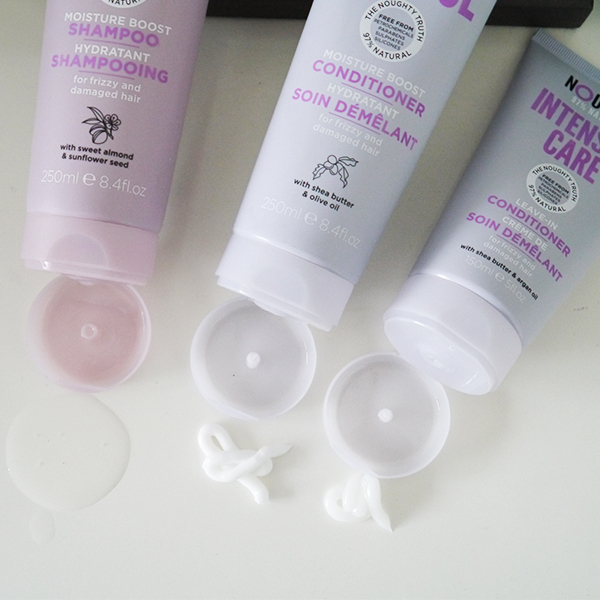 The shampoo, conditioner, and leave-in conditioner I received for review are meant to combat frizz and damage. Noughty's ultra-moisturizing shampoo promises to nourish hair and repair damage with sweet almond oil and sunflower seed extract. As with other natural shampoos, you'll want to wet your hair as much as possible before lathering up to get any sort of suds, and you'll want to concentrate the cleansing action on the roots. The sweet almond oil gives the formula a delicious scent, and the formula cleansed effectively without making my hair feel stripped or dry. The accompanying Moisture Boost Conditioner relies on sweet almond, shea butter, and olive oil to smoothe and detangle. For a formula that features such heavy emollients, it feels surprisingly lightweight on strands and rinses away very cleanly. I could feel my hair detangling even sans combing. 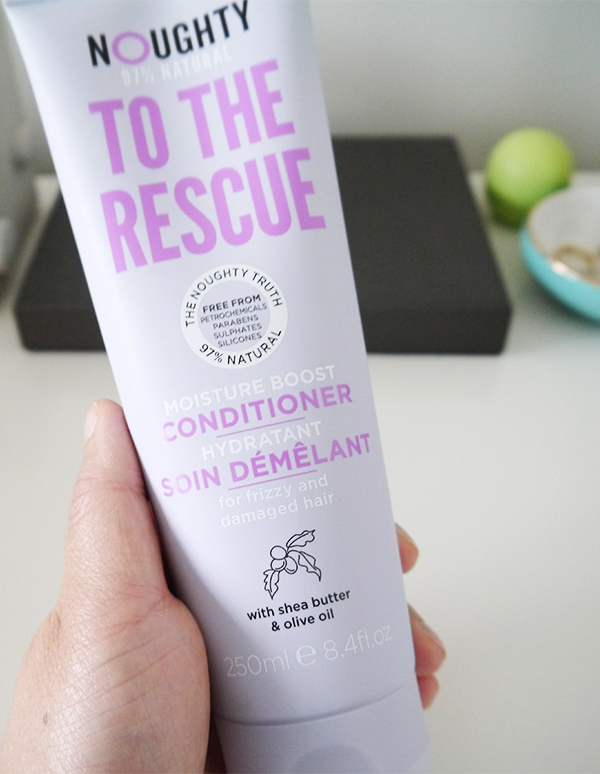 Unlike other conditioners, I didn't feel the need to use twice as much conditioner as I do shampoo because I knew that the much richer leave-in conditioner was the next step. After towel-drying my hair, I usually comb some sort of de-frizzing styling creme or serum through the ends to keep them from frizzing and pouffing out into a triangle shape. In the past I've used conventional frizz serums and styling cremes loaded with more silicones than moisturizing ingredients, but not so with Noughty's Intensive Care Leave-In Conditioner. Shea butter and argan oil smooth everything without the help of any silicones and leave my winter-parched hair looking and feeling much healthier after I blow-dry. The instructions say to use sparingly and concentrate this on the ends—I find a dime-sized dollop is enough for my thick shoulder-length locks. 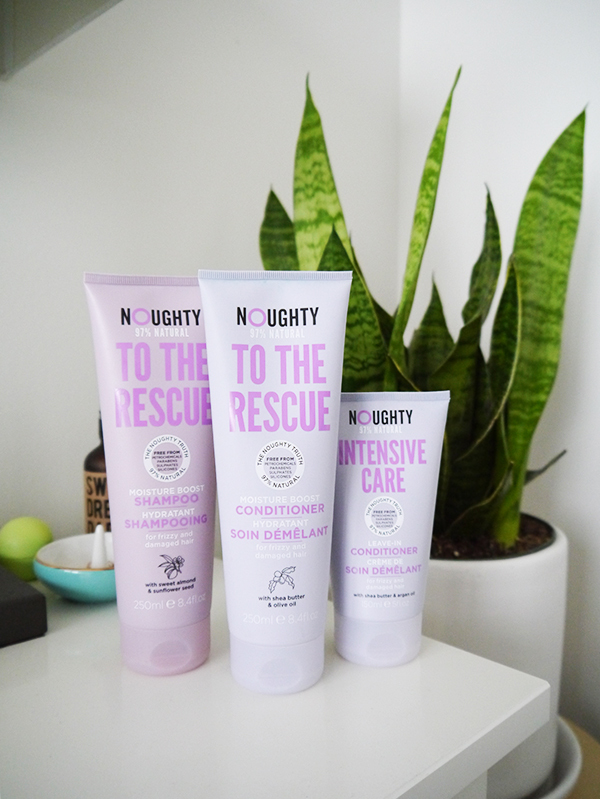 As an entire haircare range, Noughty's natural-ish formulas not only left my hair clean and healthy, they also smoothed out frizz and repaired damage more effectively than I anticipated, with results comparable to conventional smoothing shampoos and conditioners. What's more, the products are affordable and available in drugstores. What's not to love?